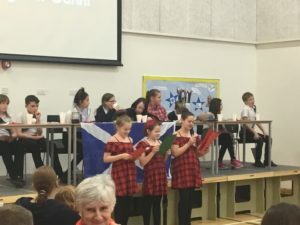 On Thursday 24th January 2019, the Primary 7s hosted a Burns Supper to commemorate the life and work of Scotland’s poet Robbie Burns. Master of Ceremonies Leon did a fantastic job on the microphone introducing each element of the Burns Supper. Levi carried the haggis in on a silver platter and presented it to the top table. The Address to the Haggis, admittedly a little later than planned, was read by Linton, Eva, Demi and Ksenija. 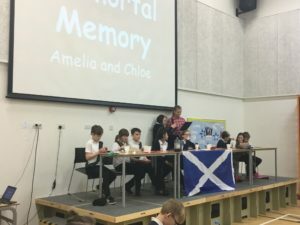 Eilidh and Emma read one of Burns’ most well-known poems ‘To a Mouse’ before Chloe and Amelia delivered the Immortal Memory speech full of interesting facts about Robert Burns’ life. The Toast to the Lassies was delivered by Rio, Olivier and Jake, much to the amusement of the audience, before Ashleigh, Aimee and Danni delivered the Reply from the Lassies. Both groups had us in stitches! 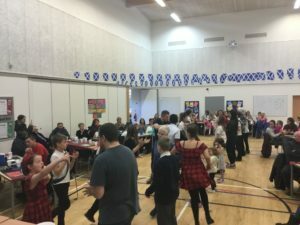 Both Primary 7 classes performed a traditional Scottish Country Dance before inviting members of the audience to join them in a second performance. Well done to everyone who volunteered/was persuaded to take to the dance floor! Lillie, Leigha, Demi, Qais and Nathan amazed us all with their performance of the Highland Fling before Hannah Byers, 6th year pupil at Harlaw Acaademy, treated us to the Sword Dance. To round it all off, Ksenija played Auld Lang Syne on her clarinet before everyone joined hands in a circle to sing along. 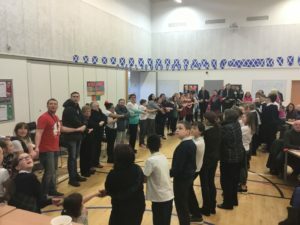 We couldn’t have done it without James, our Caretaker, who set up the hall at lightning speed for us and our wonderful kitchen ladies who prepared the delicious haggis, neeps and tatties. Thank you! Our thanks also go to everyone who came along and made the event such a success. We are delighted to have received £167.00 in donations which will go towards our P7 trip to Cromdale and hoodies. 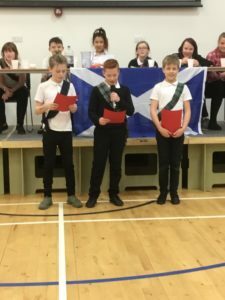 Finally, a huge WELL DONE to the Primary 7s. You were all fantastic!